How To Light With Purpose. Breaking Down Two Scenes In My Utopia. Tackling a scripted short is a challenge for many reasons. One of them, is that you lose a lot of your excuses. If you’re shooting an event and something is soft, over-exposed, or you just missed it, we can always say that it was just too darn fast. But on a scripted piece, all those reasons go away. In this case, we had months to prepare. Then the question becomes, if you could light the scene however you want, what would you do? Here is our challenge as artists. We can often see so much further than we are capable of achieving. How do we stick to that vision and push our skill set as much as we can inside a given shoot? And that too is one of the greatest opportunities in filmmaking. You can surround yourself with people who are better than you, people who can take your vision and find a way to execute it in ways beyond what you could imagine. With My Utopia, we had the opportunity to bring in some amazing help. I’ve probably learned more being on set and paying attention to field audio, gaffers, or directors more than anything else. Armed with a gaffer, grip, and a 4 ton truck full of lighting gear, we were able to pull off some pretty spiffy lighting tricks. And of course, we tried to be very intentional in how those spiffy tricks pushed the story. My Utopia is a very personal story that is both bright and dark. The whole concept of My Utopia is that of a dream, yet as we follow this dream we learn what is hiding in the shadows. Our approach to the lighting was to embrace both sides; the light and the dark. Being such a personal and strong story, we wanted to push the lighting to also help carry this drama. Here are 2 of our favorite scenes when it comes to the lighting, one light and the other dark. We’ll breakdown the lighting setup as well as the motivation behind each. 1. The Light // Lighting biggest scene in the film with…one light. We wanted this scene to have a warm summer feel. This embraces the idea of My Utopia without hinting at where the story is headed. Much of the narrative takes place in the classroom and we wanted it to feel warm and safe – a place where Stephanie would feel comfortable sharing something so intense and personal. When we were scouting, I wanted to make sure we found a room that had a wall full of windows to the left or right of the classroom. I knew this would give us a good overall ambient lighting level and mean we would need less lighting to achieve the warm summer day feeling. We found classrooms that may have been strong, but if the windows were to our backs, it would have been to much to block them, only to recreate that large soft source from the side. Half of our lighting was done in simply choosing the right location. Light Stephanie so that she stands out visually. Ideally split lighting (half her face in the light, half in the shadow) to embrace the split personality of the overall film. Add a slash to the chalkboard which adds to the summery feel, brings the attention to Steph, and also gives a natural spotlight feel. Fitting to read an essay in front of a class. Have enough overall light to maintain a 5.6 aperture for our opening shot. 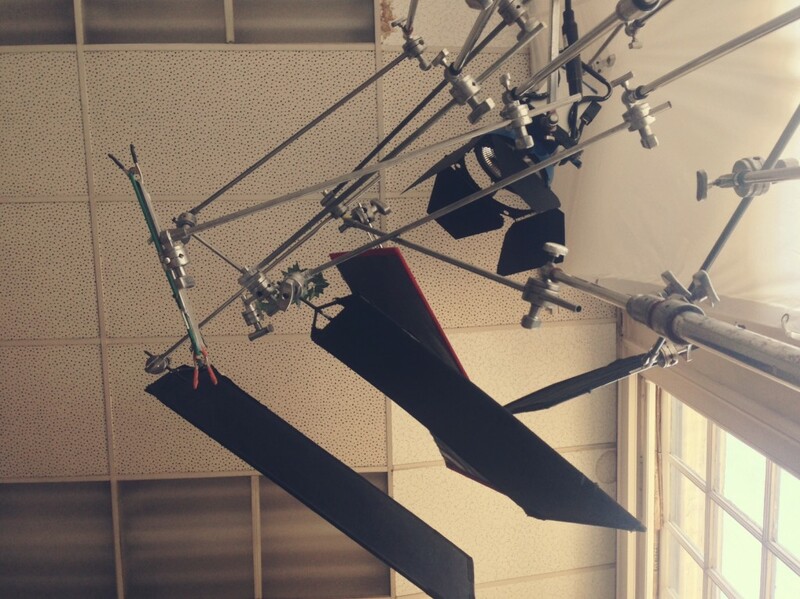 We didn’t think we could pull focus with anything less, so we needed to make sure we had enough light. 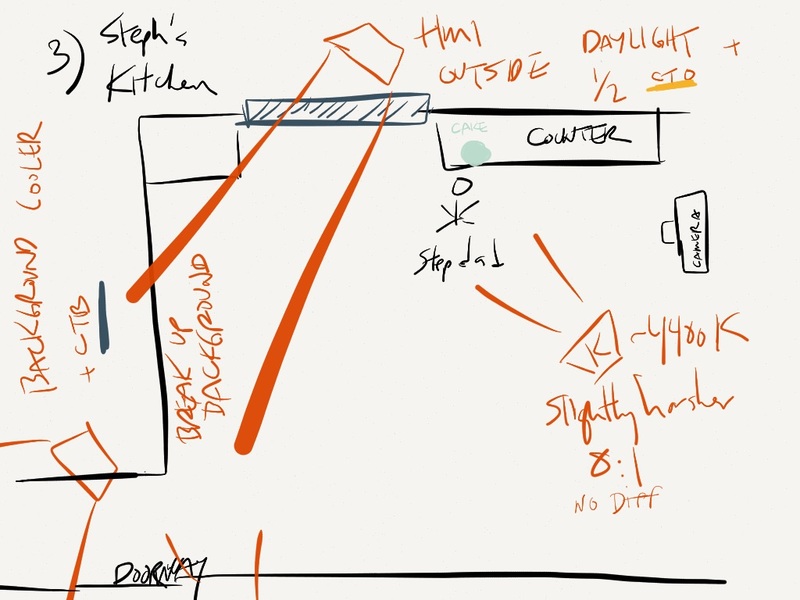 Take a look at our original lighting plot and then we’ll break it down. Keep in mind – these our our actual lighting plots and they do vary from the final lighting setup, which we’ll discuss below. 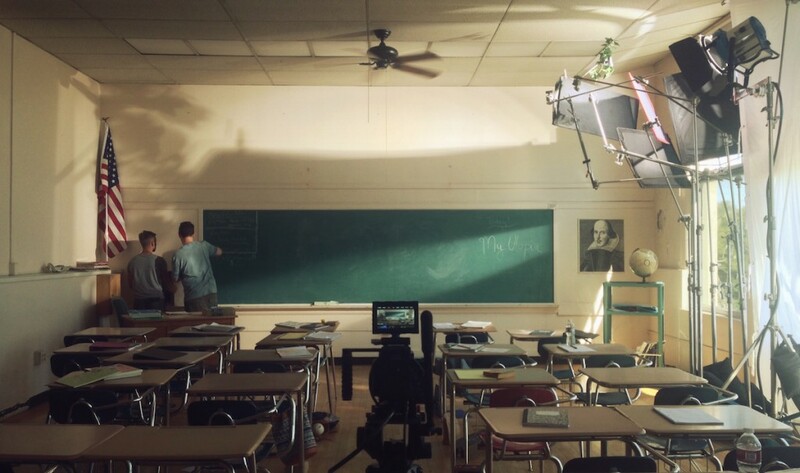 While our original lighting plot saw two HMI’s in the scene, one on Stephanie and another just for the chalkboard, our amazing gaffer was able to pull it all off with one. One Arri M18, an 1800 watt HMI with a whole lotta modifiers. The overall concept would be to split the light into two beams; one that hits the chalkboard and creates the light streak, while the other lights Stephanie. Since we were going on split lighting on Stephanie, we could have the HMI close enough to the chalkboard to make it work for both. The light on the chalkboard was shaped using a series of flags. By leaving the light harsh, with no diffusion, we got that distinct shape you see. The light headed towards Stephanie needed some heavy diffusion to be be soft enough for our warm summer feel. A stand was put up with some thick diffusion and angled just right so it only softened the light heading in our talents direction. Our big issue was then the overall ratios. We wanted the light on the chalkboard to be roughly equal to the key side of Stephanie’s face. In other words, we didn’t want the chalkboard super bright and distracting. Since the light on Steph was diffused, that then cut the amount of light that reached her. We then added a double net to the light heading to the chalkboard to bring it down and provide a better ratio. As we were setting up the lights, we made sure to have our camera setup. This is an often overlooked step as nobody wants to fall behind schedule. Always seeing your picture lets you know what each light to modifier adds or takes away and what you can hide both inside or just around your frame. In this setup of our wide shot, we had the flags and modifiers pushing the edge of the frame. You can also see above the chalkboard how the gag is given away with all of the light and shadows – we had to make sure that was all out of our frame. We had a couple things that didn’t work. The particles in the air you may have noticed on the lighting plot was something that we just couldn’t pull off. We needed a light to come from behind and cut through the dust to illuminate it enough to show up on camera. While we could somewhat pull it off, it was taking way too much time and work to show up just a tiny bit. I knew that would slow us down way too much on our first shoot day. 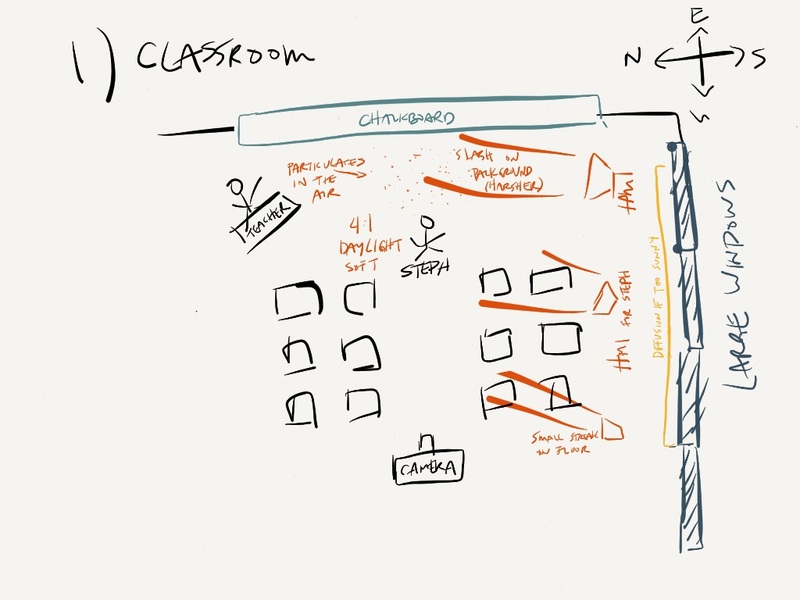 We also had planned a small light streaking across the back of the classroom floor to add some depth to the opening shot. Ultimately we just ran out of time and never got to it on our day of prep and rehearsals. 2. The Dark // Adding darkness to our villain. This was one of our toughest scenes to shoot overall. Everything in this scene is based on a real memory of Stephanie’s. Mike Butters, our talent, pulled it off with incredible conviction. We knew we had nailed it when the whole crew was repulsed in playback. 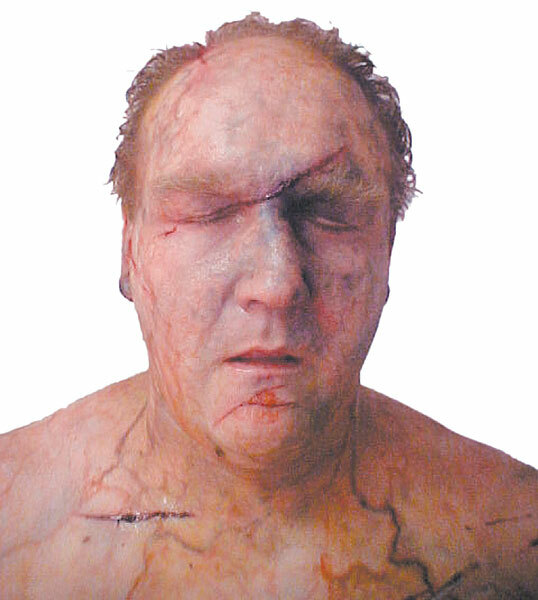 By the way, if Mike looks familiar, that may be because you recognized him as the villain in the SAW horror franchise. We only have two scenes in the film that show us the villain and we wanted to make sure you felt the horror and disgust. We designed these scenes to have a lot of shadows, to add to the horror, while also using colder background tones. While this scene looks simple enough in the final film, it has about 6 lights setup to pull it off. This lighting plot is fairly close to how we ended up in the final scene. Two hours of setup and we ran through this whole scene, the three shots, in no more than 10 takes total. You likely noticed on the lighting plot the heavy use of color within this setup (lots of Kelvin settings or colored gels scribbled down). Another HMI in the far background, but this one with a CTB to make the temperature even cooler and further separate it from the foreground. The light on the middle doorway was a Kino Diva with two tungsten and two daylight bulbs to match out foreground. When it came to lighting our stepdad as he steps up to the cake, there are a couple things worth noting. We certainly wanted a more dramatic ratio than most of the other scenes – we had that planned as an 8:1. But we also wanted to broad light him, which will make him feel bigger. We avoiding using any diffusion on the Kino Celeb to also make him look harsher. The light was positioned slightly below to give a horror feel without pushing it too far that it brings you out of the story. This is what I LOVE about scripted work. The idea of combining all of these decisions makes a huge difference on the tight shot below, but none of those would have been my first instinct had we shot quickly and without pre-production. Sitting down with each scene and asking what we wanted to communicate, then working through every facet of our lighting – temperature, direction, quality (harsh/soft), and intensity – to further the story. In looking at the lighting of the film overall, here are some key take-aways, that making this film absolutely reinforced for us. Don’t fight your locations. Try to find locations that give you a head start and always listen to the light that’s there. Always setup your camera first. Know what each light adds (or takes-away) and keep a constant eye on your frame. You absolutely don’t need a lot of lights to light a great scene. Remember the four properties of light and try use them all within each scene (temperature, direction, quality, and intensity). Up next, we’ll show you how we pulled off a pretty nifty lighting trick using some lights I stole from my living room. Any questions about the lighting of My Utopia? We’d love to chat. Great stuff as always . . . Is your mystery light hitting the Reagan portrait & flag, by any chance? Inspiring techniques and approach one step further each and everytime, many thanks for sharing. Same sensitivity and vision. I think you may have had a light above the right top corner of the portrait on the wall + diffusion (shape of the leaves of trees) to get a natural sunny summer ambiance both on the picture and flag. Good guess Eric, but that is all the HMI and bounce light. Thank you so much for this article. This is wonderful. I am a avid reader of your blog. I’m going out on a limb on this one, but is the hidden light is being used to light up the bottom half of Stephanies body? If yes, then the light source is probably towards the front of the classroom and low enough to be hidden by the student desk. When we got the scene lit up, we were pretty amazing by what one HMI could do. But as we looked at the monitor, Steph’s legs looked rather dull and dark. We hid a Kino Celeb behind the kids and carefully wired it so that you wouldn’t see it in the wide. That extra light on the floor adds a ton of life and dimension to the bottom half of her body. Email us – discovery@stillmotion.ca with your mailing info and we’ll send out your field guide! I believe there is a light behind the kid in the red jacket (in front of Shakespeare) on the right of the frame. This light is lighting the ground and giving the small streak you see across the floor under his desk and the desk to his left. Is the hidden light giving the window frame under Shakespeare? Back to reading the article. Wanted to post my guess! Richard has got it right on though – check the comments below. I think you may have had a light outside to accentuate the shape of the window cross on the wall (at the right of the chalkboard) but I don’t see it in the final piece (so it could be an unwanted light beam from the sun with a too harsh ratio you chose to hide). Good guess but nothing else was outside. Richard guessed it below – it was hidden in front of the kids that are front right in the classroom and is lighting the bottom half of Steph’s legs, giving them life and depth. Ahh, love this. LOVE stuff like this. It’s what I dream of doing one day. Thanks so much team, for posting behind the scenes stuff like this – it really does give people like me a chance to see inside the minds of people like you who put this together. It’s very inspiring. Very intriguing. Thank you so much for taking the time to write it and having the BTS filmed as well. Also, I love how much thought you put into your projects. It really challenges me to do the same, and start thinking outside the box, so to speak. You give me things to think about that I may not have ever considered. So thanks for that as well. Patrick, I would love to know more about directing the talent and the whole approach. I would appreciate have more BTS when you are talking to the people and catch some tricks from there. What a good idea to present this story into a short film. Great work guys! Your approach is still inspiring. Great short film! How did you come across that story, and how did you decide to make it into a full-on production? How are you looking to leverage the piece for future work?? Stephanie is one of the characters in #standwithme, our documentary we produced last year. We met her in making that film and developed a relationship. She then came to us asking for help in making a book trailer. I cannot thank you enough for all the information and insight you share in crafting stories. Hopefully I can find the time to attend one of your workshops in the near future. One question though. Your lighting plots are fairly detailed with what lights you wanted to use and what color temps and ratios you are using. Is that something you already knew walking in or is it something that you created with the help of your gaffer (in other words did you specify the inputs as well as the outputs or did you just describe what you wanted and left it to your expert to define what you needed)? If this was all presaged, could you point me in the direction of a good primer on how to select the specific fixtures and color temperatures that you chose? Obviously, I’d love to go to something like one of Shane Hurlbut’s workshops, but the price currently exceeds something that I can afford as a hobbyist when I could be spending money on other things like good glass. I appreciate any additional insight you can offer, but also respect any knowledge you wish to keep proprietary or reserved for inquiries which have a cash value associated with them. In any event, your continued sharing of information and expertise is truly appreciated and I love following the success you all are having as a team (along with many of your colleagues). Great short film! this is wonderful, congratulations!